F. White, “Rational Energy Choices in the Wake of Fukushima”, International Journal of Medicine and Public Health, vol. 1, no. 4, pp. 1-1, 2011. 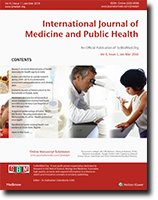 F. White, “Climate Change and the Expanding Global Reach of Dengue Fever – Warnings unheeded?”, International Journal of Medicine and Public Health, vol. 1, no. 3, pp. 1-1, 2011. L. Waghmare, Shrivastav, T. , Khatib, N. , Jain, A. , Zodpey, S. , Gaidhane, A. M. , and Zahiruddin, Q. Syed, “The Cross Sectional Study of Anthropometric Parameters in Young Healthy Individuals having Parental History of Hypertension”, International Journal of Medicine and Public Health, vol. 2, no. 1, pp. 38-43, 2012.